A former club official has been convicted over the Hillsborough disaster, but match commander David Duckenfield is facing a retrial after a jury failed to reach a verdict. The six men and six women found former Sheffield Wednesday secretary Graham Mackrell, 69, guilty of failing to discharge his duty under the Health and Safety at Work Act. However, they could not reach a decision on whether Mr Duckenfield, 74, was guilty of gross negligence manslaughter. Jurors were discharged today, their eighth day of deliberations, at Preston Crown Court. The CPS has indicated it will seek a retrial for Mr Duckenfield. About 60 family members gathered at the Cunard building in Liverpool gasped as the jury foreman told the court they could not reach a verdict for Mr Duckenfield on which they were all agreed. The jurors retired to consider their verdicts on Monday, 25 March, after a ten-week trial. After a week of deliberations they were given a majority direction, meaning verdicts on which at least ten of them agreed would be accepted. Retired chief superintendent Mr Duckenfield denies the gross negligence manslaughter of 95 Liverpool fans who died at the 1989 FA Cup semi-final. The prosecution in the case had alleged Mr Duckenfield, 74, had the "ultimate responsibility" at the ground for the match between Liverpool and Nottingham Forest on 15 April 1989. The court heard he ordered the opening of exit gates at the Leppings Lane end of the ground at 2.52pm, eight minutes before kick-off, after the area outside the turnstiles became dangerously overcrowded. Richard Matthews QC, prosecuting, told the court in his closing speech that Mr Duckenfield, who was promoted to the role less than three weeks before the match, should have had the knowledge to make "key lifesaving decisions" on the day. He said many of the failures alleged by the prosecution had been admitted by Mr Duckenfield when he gave evidence at inquests Into the 96 deaths in Warrington in 2015. Benjamin Myers QC, defending Mr Duckenfield, told the jury those comments were made with the benefit of hindsight and some of the questioning did not take into account his memory of the day. He argued the case was "breathtakingly unfair" and said Mr Duckenfield had "tried to do the right thing". Mr Duckenfield's defence case lasted just 74 minutes and consisted of read evidence from Bernard Murray, the late superintendent who worked as ground commander and Mr Duckenfield's deputy on the day. Mackrell, who was safety officer for the club at the time, was accused of failing to take reasonable care, particularly in respect of ensuring there were enough turnstiles to prevent unduly large crowds building up. He is due to be sentenced on Monday 13 May and faces a maximum sentence of an unlimited fine. 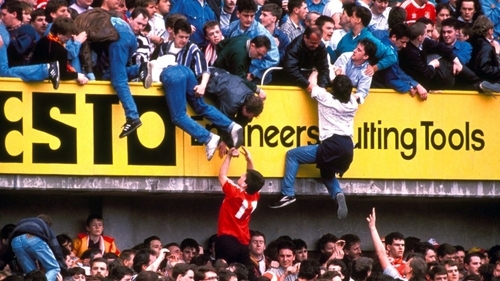 Hillsborough Family Support Group chairwoman Margaret Aspinall said the families of the 96 fans killed at the 1989 FA Cup semi-final had no closure. Mrs Aspinall, whose son James was 18 when he died in the crush on the Leppings Lane terrace, said: "We were all hoping we would have some sort of closure today and we haven't. We have still got a long journey." In a statement, Liverpool FC said: "Liverpool Football Club would like to reiterate our support and admiration for the Hillsborough families, survivors and campaigners in light of today's verdicts at Preston Crown Court. "While forthcoming legal proceedings restrict comment on the outcome of the trial, we acknowledge the guilty verdict for Graham Mackrell and can empathise with the frustration shared by everyone affected by the Hillsborough tragedy that the outcome was not definitive.